Today’s post is a Special Request post for a reader who shall remain anonymous. Her question concerns how to tailor her letter and c.v. for different jobs. Here’s the background: She is a Victorian literature specialist and on the job market in English (I know, more’s the pity). She’s applying for Victorian specialist jobs, but also writing jobs and the occasional generalist position as well. She has experience teaching writing, and she’s heard through the grapevine that search committees are impressed with her application for writing/generalist positions, but that her c.v. is so Victorian lit-heavy, that Victorian lit colleagues have responded unfavorably, claiming that she is going to invade their turf, so to speak. So she wants to know: how can she ethically tailor her letter and c.v. to appeal to the writing/generalist positions without frightening the Victorianists already on the faculty? I have not actually seen her job letter and c.v., so I am not basing my response on an actual example, but on principles. And English is not my field, and at the same time it’s a highly regimented field that serves many service needs on campuses, so it’s possible that my understanding of the principles may need some amplification in the comments below. So, readers from English, please feel free to comment. The principle is that in this kind of case, where not just the specialization, but the very nature of the job is distinct, the cover letter should be highly tailored to match the position. What that means is that if she is applying for a writing job, then her primary role in the department is to teach writing, and not to act as a period specialist. In that sense, the profile she will present to the department is a teaching profile, with some Victorian research skills thrown in as an “extra.” I would recommend that her letter put her teaching paragraphs first (after her self-introduction paragraph), and that these be the main bulk of page one. The teaching paragraph should describe what she has taught, what she is capable of teaching, and what she envisions teaching for the department, based on the needs identified in the ad, and on their course listing (but never, ever using course numbers, which is tacky). She should give some specific teaching strategies that she uses in the basic remedial, introductory and advanced Writing classroom, and how and why they worked. These should be innovative enough to be memorable, and not just obvious things like “I encourage discussion.” She should indicate or summarize student responses or evaluations. After these two paragraphs (I don’t normally recommend more than two paragraphs dedicated to either teaching or dissertation research in a job letter), she can move into her dissertation research, and her publications, a second project, and then her tailoring paragraph. The publications do not have to be listed in their entirety—one or two are appropriate. Her second project should be mentioned, as I am assuming that this is still a tenure track position, and tenure requires a forward-looking research trajectory. If that is not the case, and it is not a tenure track position, then a second project should not be mentioned. Her tailoring paragraph should emphasize teaching innovations and initiatives, as opposed to ones focused on research. In terms of the c.v., again, Teaching can be listed first after Education and Professional Employment. Publications should of course be listed in their entirety; I never, ever recommend removing a publication from a c.v. for tailoring purposes. Teaching Awards and so on should be emphasized if there are enough to make a separate heading or subheading. She should have a teaching reference, preferably a colleague from her current position if she is beyond graduate school. That reference will be a fourth reference, after three academic references, if the job is a tenure-track position. If it is not a tenure-track position, then the teaching reference can be the third of three references. All of these things together create an impression that the person is genuinely interested in teaching Writing, and will not be a shadow competitor to the Victorian specialists in the department. Now, be aware that some Victorian specialists will be absolutely thrilled to get a specialist comrade in arms “for free,” as it were, through a Writing search. So this type of paranoia is not universally necessary. However, since she has received this specific feedback previously from a search, it is safe to assume that the problem does exist. By retaining the research and publication elements of her profile (which always increase her capital on the market), while clearly demonstrating a primary interest (in the letter and c.v.) in the Writing position, she should be able to balance the two audiences for the search, and let the search committee feel that she is a “both/and” candidate, rather than an “either/or” candidate. Today’s post is a Special Request post for Amy, who wishes to know how the standard “dissertation” paragraph of the job letter should be adapted when the writer is well beyond dissertation stage. This is a good question! Applying for jobs mid-career is remarkably tricky. It’s hard to know how to frame your research when it has moved on from the single, discrete dissertation project. The key here is to stay specific, and show a scholarly trajectory from the dissertation to the present. You want to have a “current project” that you will be able to describe with the same level of care and specificity that you once used for the dissertation. Begin with this current research. The project should be described in terms of the topic, the methods you’re using to address it, its significance, and the field-changing interventions that you are making through it. You will then follow this paragraph with a discussion of the publications that have derived or will derive from it. The temptation for people beyond the dissertation is to mention two or three or four new avenues that they are pursuing….but this is a mistake. The candidate being hired as an advanced assistant professor still needs a coherent “second book project” (or series of articles) to get tenure. The candidate being hired with tenure will still be scrutinized for promotability to Full. These promotions hinge on the same kind of single-minded focus and productivity as the first project, under far more challenging conditions. A discrete and specific project, with a clear publishing trajectory, communicates this productivity. The second (or third) project should be shown to arise organically from the original dissertation project and/or other major project that preceded it. These projects will be listed after the current research, and before the still-necessary “next project” paragraph. This trajectory shows the kind of scholarly focus and consistency that search committees want to see in mid-career hires. This doesn’t mean you have to keep doing the same thing over and over. But you do need to be able to show that your general scholarly profile is going to remain somewhat consistent. In my own case I had a first project on Japanese women pursuing internationalized careers and life trajectories. My planned second project (which I never actually brought to fruition) was on Japanese alternative, back to the land communities and their connections to a global eco-movement. These projects are pretty different, but they are also: 1) both on Japan; 2) both on globalization; and 3) both on people who stray from the mainstream. That is the level of consistency I’m talking about. Think about it from the department’s point of view. They want to know that the person they are hiring to fill a specific pedagogical and scholarly role is the scholar who will continue to do so for years into the future. They don’t want a dilettante, or someone easily distracted, or who is going to leave a bunch of graduate students who came to work on U.S. nuclear issues in the lurch when he suddenly switches over to a major project on Pacific Islander taro farming techniques. Trajectory shows maturity and consistency and predictability. Again, this doesn’t mean you harp in a backward-looking way on a long-past dissertation. And it also doesn’t mean that you can’t pursue interesting new areas of research. Rather, you quickly and gracefully demonstrate the deep convictions and scholarly preoccupations that have continued to inspire you over many years. Today’s post is short. It’s about the Research Statement. There’s undoubtedly a lot to say about Research Statements. But Dr. Karen doesn’t have time today, because she’s submerged in client work with looming deadlines. Talk About the Research, and Not About Yourself. I statements are not verboten. They just need to be minimized, and carefully contextualized so that the research is always forefront, and your ego is secondary. The fellowship season is upon us, and I’m working with clients on all sorts of grants and fellowships. As part of that process I’m spending a lot of time talking people through the Dr. Karen Foolproof Grant Template. I won’t repeat the template here—I just direct you to this post. 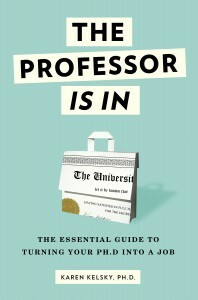 And if you want an even more substantial discussion of it, check out the Professor’s Guide- The Grant-Writing Handbook, in the Prof Shop. Today I want to talk about how I ended up creating this template. Because the story is very revealing of how successful techniques circulate in quiet, backchannel ways. When I was a brand new assistant professor, I had a senior colleague. This senior colleague had recently moved to Oregon from an elite East Coast institution. He had been successful and well liked there. He very kindly took me under his wing, and I learned a great deal from him. One of the things that he told me in my first year was: apply for major national fellowships, and don’t stop until you get at least one full year off to write your book. I listened to him, and did as he said. He had received the National Endowment for the Humanities Fellowship a few years earlier, and he encouraged me to apply for it as well. When I started work on the application, he passed on to me his own previous successful proposal. And he explained to me that this proposal was based on another proposal that had been written by one of his senior colleagues back at the elite institution. I was at least the third generation to draw from the model. I immediately saw the utility of the proposal structure, and used it again and again. I got virtually every grant and fellowship for which I applied. When I had graduate students of my own, I passed the model on to them. By this point, I was referring to it as the “grant template.” Each of my students structured their grant and fellowship applications according to the template, and every student got virtually every major fellowship for which they applied—over the years, some $600,000 worth of fellowships, in our modestly funded fields of Asian Studies and Cultural Anthropology. I freely shared the template, in the form of my own NEH fellowship proposal, with anyone who asked. But not everyone was able to separate out the structure from the model. My proposal, after all, was on Japanese women who traveled abroad in search of Western men and Western careers. Not everyone could see the organization beneath the surface, and apply it to their own project. When I left my academic career and came to the University of Oregon McNair Program, I began working with advanced undergraduate students, who are very green in the ways of the academic world, but who are ambitious and eager to apply for much-needed fellowships. I quickly saw that my template would once again be useful, but that I was going to have to help. They were much too inexperienced to be able to decipher the organization themselves. So I took the next step, and I did it for them. I reduced my old NEH proposal into its elemental building blocks, and provided a basic explanation for its parts. I saw that the structure is, at root, a Hero Narrative, and named it as such. I came to understand that constructing this narrative is entirely formulaic, and hinges on the construction of urgency. Those grants that create a sense of legitimate and credible urgency get money. Those that don’t, don’t. Now the template is in the form of a one-page diagram, with a brief textual accompaniment. You can see it here. I am happy to share it, although I appreciate getting credit. The point I want you to take away from all this is not just that this template, now called the Dr. Karen Foolproof Grant Template, really works. I also want you to understand that effective grant-writing, like all other professional academic writing, is at its root completely formulaic. Your project can be creative and innovative, but your grant proposal had damned well better follow the formula. Deviation means failure. Some of the most creative thinkers in the land are the worst grant-writers, because they can’t or won’t write according to formula. I can see that. My analytical and linear mind loves to reduce things to their component parts and find the underlying structure. But not everyone is like that. The template does some of the work for you. Not all of it. I’m still surprised sometimes at what comes to me from clients who swear that they’ve followed it “exactly.” But it helps. And on a larger scale, the story of the template demonstrates the ways that hidden codes and understandings operate in academia. They’re not secret, exactly. But they’re hidden, and passed along through personal connections and contacts. Stay alert to these codes and models when they cross your path. They are the capital of an academic career. And always be ready to pass them on to others. It’s good karma. Some feminists don’t like the Dr. Karen method. By the Dr. Karen method I mean my practice of telling women to stop acting “like girls” and to start learning to recognize and master the codes of power and authority that operate in academic settings, which are almost entirely derived from male patterns of behavior. I get it. I mean, what feminist can really get behind telling women to act more like men? And yet, that’s exactly what I’m doing. I look at the modes of behavior that the vast, vast majority of young women unconsciously adopt, and what I see are the ways that they systematically, with extraordinary consistency, undermine their own voices and sabotage their own career prospects. To the degree that they continue unconsciously adopting these behaviors, they will fail to advance in their academic careers. And I want to see them advance. So I target the ineffective behaviors, and urge on them replacement behaviors that are, quite simply, less stereotypically female, and more stereotypically male. What is it that women do that is self-sabotaging in academic settings? Minimize their accomplishments, hang back from debates, apologize for their opinions, make excuses for their so-called “failures,” smile too much, laugh too much, dissipate their time and energy in nurturing needy students and peers, compromise their intellectual integrity, shrink into the background, bend over backward to be agreeable, and spend more time soothing professorial egos than standing up for their points of view. I do hear what they’re saying. I reject it because, at The Professor Is In, we’re not about the normative, we’re about the descriptive. And if a young woman who comes to me for advice wants to have a career in that world, after already investing some 5-10 years in preparation and indebtedness to do it, then my ethical commitment is to arm her with the full set of weapons she needs to succeed. Yes, I am using the military metaphors deliberately. She needs to stop acting like Little Bo Peep when her job is taking her into the Killing Fields. No, you are judged—on the job market, and at tenure—by your individual production of scholarly work and your ability to make claims for this work that are bold, assertive, and supremely confident. “When I was 19 and three days into my freshman year, I went to see Bill Warfel, the head of grad theater design (my chosen profession, back in the day), to ask if I could enroll in a design course. He asked me two questions. The first was ‘How’s your drawing?’ Not so good, I replied. (I could barely draw in those days.) ‘OK, how’s your drafting?’ I realized this was it. I could either go for a set design or lighting design course, and since I couldn’t draw or draft well, I couldn’t take either. ‘My drafting’s fine’, I said. That’s the kind of behavior I mean. I sat in the office of someone I admired and feared, someone who was the gatekeeper for something I wanted, and I lied to his face. We talked some more and then he said ‘Ok, you can take my class.’ And I ran to the local art supply place and bought a drafting board, since I had to start practicing. That got me in the door. I learned to draft, Bill became my teacher and mentor, and four years later I moved to New York and started doing my own design work. I can’t say my ability to earn a living in that fickle profession was because of my behavior in Bill’s office, but I can say it was because I was willing to do that kind of thing. The difference between me and David Hampton isn’t that he’s a con artist and I’m not; the difference is that I only told lies I could live up to, and I knew when to stop. That’s not a different type of behavior, it’s just a different amount. Academia is not a particularly nurturing or kind place. There are kind and supportive people in it, to be sure. And there is much good that is done in the classroom, and among colleagues, and in scholarly collaboration. But ultimately, academia is based on judgment and evaluation of individual productivity. And the agent of that productivity is you, and you alone. * You are judged by your work. The person who stands up for your work, is you. Guess what, women? Nobody’s going to help you gain this confidence, this ego, this ballsiness, and few are going to praise you for displaying them. On the contrary—these have been beaten out of you since the day you were born–through shaming, and rejection, and criticism, and undermining. But that doesn’t change the facts, which are, without them, in professional and academic settings, you will always play second fiddle to some man, and you will always be and do less than you are capable of. It is the starting principle of The Professor Is In, that if you want an academic career in this disintegrating market, you cannot be distracted by time investments that do not pay off. You have to be both selfish and self-promoting. You have to advocate for yourself. Oftentimes you have to fight for yourself. At the bare minimum you have to be prepared to “toot your own horn” (in my Depression-era parents’ favorite phrase), insist on your place at the faculty conference table, form a strong opinion, express it audibly and firmly, and defend it, and not back down. I want to see women get into the academy and succeed there. Women in the academy change the academy. I saw it countless times in my own university surroundings. Women sitting at the table changed the nature of the dialogue that took place at the table. But the women who were sitting there got there did not get there by acting “like girls,” but by being tough, and fierce, and talking and acting quite a bit like the guys. The institutions that offer these opportunities operate in an environment where accurate information is hard to come by. One of their main sources of judgment is asking the candidate directly: Tell us why we should admit you. Tell us why we should hire you. Tell us why we should give you a grant. Tell us why we should promote you. In these circumstances, people who don’t raise their hands don’t get called on, and people who raise their hands timidly get called on less. Some of this is because assertive people get noticed more easily, but some of it is because raising your hand is itself a high-cost signal that you are willing to risk public failure in order to try something. I may personally wish the academic world was other than it is. But as Dr. Karen, I will not make individual young women Ph.D.s on the job market, or in the probationary pre-tenure period, the martyrs to an imagined feminist fantasy of what the academy “should” be. The academy is what it is. I take my job to be to prevent young women from misreading it so profoundly and wandering out onto the market (and sometimes all the way to tenure) like Little Bo Peep, or like so many sheep to the slaughter. Graduate students ramble. The question is not, do you ramble. The question is, why. I was on the phone with a client last week, working on interview responses for an upcoming fellowship interview, and for the first time, I understood the answer to this question. Graduate students ramble because you are afraid to stop talking. Because if you stop talking, then your answer is finished. And if your answer is finished, then you have to commit to it. And it has to sit there, and either be right, or wrong. One way or another, you sink or swim on that answer. Guess what? If you want to get hired for a tenure track position, you have to commit to your final answer. You actually have to speak in declarative sentences with a strong falling tone at the end that signals, aurally, the period. You have to stop, and then wait. Wait while your interlocutor processes what you said, reflects on it, and then responds with thoughts of her own. And guess what? She might disagree with you. Yeah, she might. And you still have to respond in declarative sentences. Interviewer: What text would you use for the introductory course? You: I would use Martindale. You: Because I think Martindale does the best job of bridging social and political economic viewpoints. He’s not the strongest on contemporary developments, of course, but that can be augmented with other readings. For the basic textbook, I think he gives the best and most thorough overview. Interviewer: I used Martindale last year and I thought it was terrible. The students hated it. It was disappointing because I’d heard such good things about that textbook. You: Really? That’s interesting. What happened, do you think? What did the students dislike? Interviewer: They found his writing too hard to follow, and the format was confusing. You: Interesting. When I’ve used that textbook students have given it positive feedback. But that may be because I make them study guides of each chapter, and walk them through the chapter the first day we cover it in class, alerting them to the parts to focus on for the lectures and exams. Interviewer: Ohhhh, what a good idea! I’ll bet that would help. We should talk more! I’m ordering my books for the next term this week, and I’d like to talk with you more about the options. You: Perhaps over dinner after my talk today? I’ll look forward to it. OK, what happened here? What happened here is that the interviewee stuck to his guns. He had a position, he stated it clearly, and he defended it. He did not panic and fall down when the interviewer took an opposing viewpoint. And what happened as a result? He had a meaty, substantive exchange with the interviewer that resulted in him coming across as a credible, authoritative and effective teacher. It resulted in a deeply satisfying dialogue. It also ended with the interviewer wanting to know more. And that, dear readers, is where you want your interviewers to be. You want them eager to know more, and ready to ask for it. You: I would probably use Martindale, although, you know, there are a lot of good options out there and I’ve heard good things about Nelson, and Richardson, and you know of course, NO textbook really covers everything so you always have to augment, but I’m sure you already know that….! Interviewer: Ok, ok! So, anyway, why would you use Martindale? You: Because I think Martindale is pretty good on social and political economic viewpoints, although, you know, a lot of people say that he’s not that great on contemporary developments, but that isn’t always the main thing, because sometimes I assign other readings for that, like the Patrick piece from the Annual Review, and this great article I found on current theory that was in this one reader out of Routledge, and even though sometimes those are too hard for undergraduates it’s pretty important that they get a sense of the field….so, um, yeah, what was the question? You: Oh, wow, really? Oh gosh, I never even thought of that. I wonder if my students thought that? You know, a few of them DID say to me that it was kind of hard to follow and I noticed that their quiz scores were really low in the beginning, so I was trying to figure out what to do, and I thought of maybe making study guides that would help them, so I made some and it seemed to help, but you know, it’s hard to say, and I should really look at some other textbooks, like maybe Nelson, which is what my advisor used when he taught that class and I was his TA, so yeah, I hope maybe I can ask you what has worked for you because you know I’d definitely do whatever was expected for the way the department teaches that class……. you know? Interviewer: Ummmm, ok. So moving on to the next question…. overwhelming his interviewer in several panicked, inarticulate monologues. squelching all opportunity for collegial dialogue. undermining his own authority and credibility as a teacher. reinforcing an outdated subordinate identity as a graduate student TA. burying the effective teaching method that he devised to deal with the text, which was creating chapter study guides. boring and alienating the interviewer, who drops the subject and irritatedly moves on to another question. In short, the panicked, rambly effort to just keep talking until some kind of magic “right answer” will present itself…… that effort is precisely the behavior that bombs the interview and disqualifies the candidate as an effective teacher, a confident professional, and most of all, an appealing colleague. The fact is, there are not that many “right answers” in a job interview. Sure, there are sometimes strong ideological, methodological, and pedagogical orthodoxies that some departments adhere to, and it’s important to keep all of your antennae alert to those. But you can discover many of those by thorough research ahead of time. The fact is, there are fewer orthodoxies per se, then there are opinions. Because academics specialize in having opinions. And in order for you to make an impression as a credible academic, you too must have opinions, strong opinions, that you’re prepared to state clearly, and defend. That doesn’t mean being a jerk. The best interviewee is the one who is open-minded and pleasant. But not one who is a doormat, and who is so afraid of offending someone that he literally won’t stop talking because his“final answer” might be wrong. Today’s post is a Guest Post by Kristen Ghodsee, John S. Osterweis Associate Professor of Gender and Women’s Studies, and Director of the Gender and Women’s Studies Program, at Bowdoin College. I originally got in touch with Kristen to congratulate her on her excellent IHE column on strategies of self-promotion, and to commiserate over the handful of sour comments that followed it. We got to talking about her new book, co-authored with Rachel Connelly, another Bowdoin professor and TPII guest blogger, Professor Mommy: Finding Work/Family Balance in Academia. I asked Kristen if she’d be willing to contribute a post to the blog, and she very kindly has. Thank you and welcome, Professor Ghodsee! A little over a year ago, my colleague, Rachel Connelly, and I were telling a friend about our new book project, Professor Mommy: Finding Work/Family Balance in Academia. We were all driving to a bowling alley for a girl’s night out and the conversation was light and bantering. We were explaining that the idea behind the book was to help younger women scholars achieve professional success while also raising families. Our friend said something like, “So you guys think you have achieved professional success?” in a slightly sarcastic tone. Rachel and I immediately made some joke about her comment and changed the subject. But the implicit meaning haunted us long afterward. Who are you guys to be telling other women what to do? Do you really think you are both that good? I was suddenly filled with doubt. Perhaps it was inappropriate for me to be offering advice to anyone. Isn’t offering advice a form of bragging and isn’t bragging something that is unbecoming in a woman? As a professor of gender and women’s studies, I am intimately familiar with the scholarship on the social constructedness of what we consider appropriate feminine and masculine behaviors. In American culture, self-assured men are considered to be confident; self-assured women are arrogant. Driven men are called ambitious. Similarly driven women are called selfish. Studies suggest that one factor underlying the wage gap is the differential propensity for men and women to negotiate about their remuneration. But further research suggests that if a woman does try to negotiate for a raise based on her performance, both male and female bosses will negatively perceive her as self-promoting and greedy. Good girls don’t talk about their achievements. Good girls certainly don’t ask to be rewarded for them. In academia, so much of scholarly success is linked to our ability to promote the originality of our ideas. No one ever got tenure by writing a demure self-evaluation statement. Today more than ever before, social media demands that we be the primary advocates for our research and writing, and university presses are now sending out lists of things you can do to electronically promote your work. Women are told that they need to be confident and self-assured, but just not too confident or too self-assured lest we rub people the wrong way. The balancing act can be exhausting. Sometimes it is just easier to keep quiet. I have a nine-year-old daughter who is in the process of learning all of these implicit gender roles even as I try desperately to fight against them. Last summer, the pop singer Keri Hilson had a hit single called the “Pretty Girl Rock,” which my daughter loved to put on auto repeat in our car. The song was transgressive because Hilson spends the better part of five minutes singing about how pretty she is compared to other women. Although I wish the song had been about how smart or successful Hilson was, my daughter loved it because it was a woman being openly confident, something girls are taught from an early age not to do. Recently, I had the great fortune of winning a third major prize for a book I published in 2009. My college has a policy of announcing faculty honors and awards on its website. When I think about emailing the publicity folks at Bowdoin about this last prize, I find myself hesitating. They have already run two stories about the previous awards; it might be unseemly for me to ask them to run yet another one. It’s not that I am not proud of this award. I worked incredibly hard on that book, and it is wonderful to have that work recognized by my scholarly peers. But I am still afraid that my colleagues at Bowdoin will think that I am conceited. Despite all of the good feminist reasons to click that send button, I still find myself paralyzed by the thought that I will be hated because I have the audacity to win book awards and to want the world to know about them. We live in a meritocratic society where personal effort and ability are supposed to be rewarded. But in our hyper individualized work lives, the only way our peers and superiors find out about our achievements is if we occasionally tout them. Nowhere is this truer than in academia where we often toil in obscurity on our projects for years before they see the light of day. Kristen Ghodsee is the John S. Osterweis Associate Professor of Gender and Women’s Studies at Bowdoin College, the author of three books on gender and economic transition after communism: The Red Riviera: Gender, Tourism and Postsocialism on the Black Sea (Duke University Press, 2005), Muslim Lives in Eastern Europe: Gender, Ethnicity and the Transformation of Islam in Postsocialist Bulgaria (Princeton University Press 2009) and Lost In Transition: Ethnographies of Everyday Life After Communism (Duke University Press 2011). She is also the co-author of Professor Mommy: Finding Work/Family Balance in Academia (Rowman & Littlefield 2011). The best piece of advice about writing that I got as a graduate student came from my external Ph.D. committee member, a full professor in the English department. A poet and a romantic and undoubtedly a former or current pot smoker, he was much more up on his spiritual musings and pop culture references than were my anthro committee members, a rather dreary lot. His advice was always entertaining (when it wasn’t ill-informed and infuriating, but that’s a topic for another post). “Do or do not. There is no try.” The immortal words of Yoda to the young Skywalker. But why Yoda? Why then? How many of you reading this would even have thought twice about that sentence? What is it about young academics (and not only young ones, I’d hasten to add) that compels them to frame their scholarly efforts as “attempts”? Are they really so insecure? Is the outcome really that much in doubt? Through such an analysis I will try to show that…. Hope? Try? Believe? Why are scholars embarking on their studies with so much doubt? And so little confidence? Perhaps you will say that these turns of phrase are simply writing conventions, and have no literal meaning. But why use them at all? If you did the research, and reached your conclusions, then you stand by them, do you not? Efforts to modulate or soften them with hedging phrases merely cast doubt on the legitimacy of your research itself. If you couldn’t actually prove the thing, then really, you have no business saying that you did. Through such an analysis I will show that…. If you are one of the multitudes of graduate students and young academics who have come to unconsciously depend on such phrases, and I’ll bet you are, stop. They do nothing for you. They are simply one more way that junior people, and women in particular, bend over backward to express deference and submission in their writing practices. And if you’re aiming for a career in academia, those habits of deference and submission that you absorbed in graduate school need to go. Stat. In their place: Your power, expressed. This past week I did a handful of “Interview Bootcamp” sessions with clients, and will soon have many more. People are starting to look ahead hopefully to the pain and the glory of conference interviews and campus visits. And it got me thinking about interviewing. What’s a good interview, and what’s a bad one? There are many places on the web that you can find lists of potential academic interview questions. Here’s one to start. I may well post my own such list some time in the coming weeks. But for today, I don’t want to talk about lists of questions, and how to prepare for them. I want to talk about attitude. Because, in the end, it’s attitude that makes or breaks the interview. Basically, in a nutshell, confidence sells. And desperation smells. Before any interview, no matter how brief, you must put yourself into the mindset that you ARE worthy of the job. Yes, the job market is awful. No, there aren’t enough jobs for the candidates who need them. Desperation would be a natural outcome. But desperation will cost you your chance for the job you want. The fact is, self-confidence gets jobs. And self-confidence is displayed by a calm and friendly but firm assertiveness of manner. You do not apologize, you do not make excuses, you do not pander or flatter or laugh too much or twist your hands. You simply remember that you ARE the expert in your field. You DO know how to teach. Your discipline IS important and fascinating, you ARE qualified to go toe to toe with the very leaders of your scholarly world. Don’t cave, and for God’s sake, call your interviewers by their FIRST NAMES! You belong! You’re one of them! The most important thing? That you retain your sense of dignity and self-worth. Yes, the job market is awful. But no, you do not therefore have to grovel. You will survive with or without this job. Maybe poorer, maybe sadder. But you’ll survive. So hold your head up, straighten your shoulders, turn your sense of humor back on, and remember: you ARE good enough, whether you have a tenure track job, or not.